This week we continue our study of the Gospel of Mark. We will be looking at Mark 4:35-41. 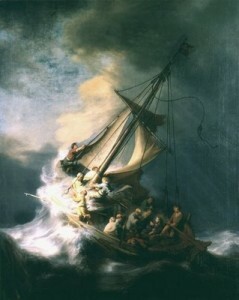 This is a familiar story about a time Jesus calms a mighty storm. As you read this passage, try to imagine yourself on the boat with Jesus and the other disciples. How would you feel? What would you do? I think that this is a story that is extremely relevant for each of us as we navigate through storms in our own lives. I also wanted to share the exciting news that Tom Rozier and Dennis Williams were baptized last Saturday and Sunday, respectively. Both were wonderful celebrations of what God is doing in each of their lives and this community at Grace2F. Ideally, we would have invited everyone to be a part of the event, but, in an effort to involve family members and friends, we had to move on the spur of the moment. I just wanted to share what happened so that you could join them in the celebration!